Ona is the brand name of The Argentine Trading Company Ltd which was established in London in the year 2000 as an importer of Argentine equestrian equipment. The trading company began operating from a small depot in Camden Town, London. Soon enough we were overwhelmed by the scale of the equestrian market place so decided to focus on what Argentina is most formidable at on horseback. In 2002, Ona was born and we became a specialist supplier of polo equipment. Necessity is the source of invention and innovation and it was not long until the idea of developing a polo specific glove became an immediate objective. It was clear from the outset that Ona would provide technical solutions, with intelligent design, assembling the products by combining the highest performing materials for the intended use. Ona products would blend design, functionality, performance and craftsmanship. This became the soul of Ona. We began working directly with elite polo athletes, manufacturers, material suppliers and technologists and used their input to create solutions that would benefit all players. At the beginning of 2003 we brought out the first concept glove and launched the Ona Polo Dura Grip gloves for the UK High Goal Season. 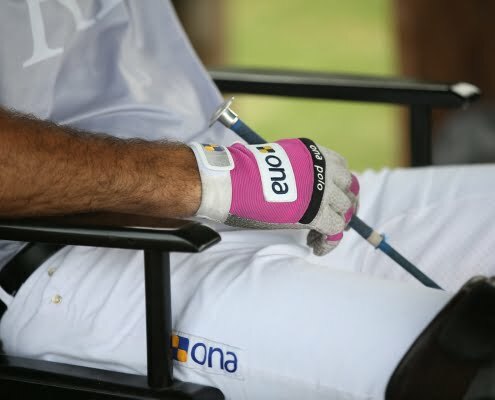 That same year two legendary Argentine polo teams, Indios Chapaleufu I and Indios Chapaleufu II, debuted with Ona Polo Dura Grip gloves at the 110th Argentine Open in Palermo. The following Argentine season we achieved what would be first landmark of many to come, Indios Chapaleufu II winning the 111th Argentine Open in Ona Polo Dura Grip Gloves. That same year, our first strap line was incorporated on our packaging: Ona Polo Gloves, The Choice of Professional Players. Three additional styles of gloves later, we are proudly endorsed by thousands of polo players world-wide who have made Ona the number 1 brand in polo gloves. Today we continue our mission with the same enthusiasm and commitment to design, quality and performance, bringing new products, elevating standards and setting benchmarks in the development of polo equipment.